LA PAZ, May 1 (Reuters) - Leftist Bolivian President Evo Morales said on Saturday he had nationalized four power companies, including a subsidiary of France's GDF Suez, in his drive to tighten state control over the impoverished economy. Morales, a close ally of Venezuela's Hugo Chavez, nationalized Bolivia's key natural gas industry soon after taking office in 2006 and has since taken control of several utility companies as well as the Andean nation's biggest smelter and top telecommunications firm. "We're here ... to nationalize all the hydroelectric plants that were owned by the state before, to comply with the new constitution of the Bolivian state. Basic services cannot be a private business. We're recovering the energy, the light, for all Bolivians," he said in the central Cochabamba region. Morales said the state now controls 80 percent of electricity generation in Bolivia and was aiming for complete government control over the sector. The decree read aloud by presidential spokesman Ivan Canelas said the state was taking control of the stakes that private investors held in four power companies, including Corani, Guaracachi and Valle Hermoso, the country's biggest generating companies. They emerged in the 1990s following the privatization of the state National Electricity Company (ENDE) and account for about half of Bolivia's electricity market. Corani is 50 percent owned by Inversiones Econergy Bolivia S.A., a subsidiary of France's GDF Suez (GDFZY.PK) (GSZ.PA). Guaracachi is 50 percent owned by Britain's Rurelec PLC (RUR.L), while Valle Hermoso is run by a private Bolivian firm called the Bolivian Generating Group. In Corani, Guaracachi and Valle Hermoso, half the shares were held by private investors with the rest held by the Bolivian state. The fourth power company nationalized on Saturday was ELFEC, which supplies the central Cochabamba region and is controlled by workers and Bolivian investors. Morales said the Bolivian government tried, but failed, to convince investors to sell the shares the state needed to have a controlling stake. "It's the state's obligation to compensate investors for their assets. ... We made an effort to reach an agreement with the private, multinational companies, but they were unwilling to reach an accord," said Morales. Rurelec said it was "very disappointed" Morales had decided to nationalize its assets in Bolivia. A GDF Suez spokesperson said in Paris the company "always respects the legislation of the country where it is active while defending its interests as a company." Several companies have launched legal action over the compensation they were offered as part of Morales' nationalization drive. Argentina-based Pan American Energy recently filed a complaint against Bolivia at a World Bank arbitration tribunal, regarding the nationalization of its Bolivian subsidiary in early 2009. [ID: nN27121450]. Morales likes to celebrate May 1, known as May Day or International Workers' Day, by nationalizing companies controlled by foreign investors. On May Day last year, he nationalized Air BP, a division of British oil major BP Group (BP.L) and the same day in 2008 he took over Entel, the country's largest telecommunications company, until then controlled by Euro Telecom International, a unit of Telecom Italia (TLIT.MI). Morales, the country's first indigenous president and a self-declared anti-capitalist, took office for a second term in January pledging to diversify the economy from its dependence on natural gas and mining exports and to launch state-run paper, cement, iron and lithium companies. 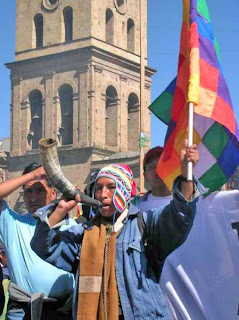 His efforts to give the state more control over the economy are very popular with Bolivia's indigenous majority, who say foreign companies have ransacked the country's natural resources and invested little to help the poor. This is a question for the webmaster/admin here at boliviarising.blogspot.com.